Pokhara Rhinos outplayed Chitwan Tigers in every department in the second match of the tournament. Winning the toss, Rhinos skipper Shakti Gauchan invited Tigers to had bat first. Rhinos bowlers made the skipper decision correct with significant pace bowling display. 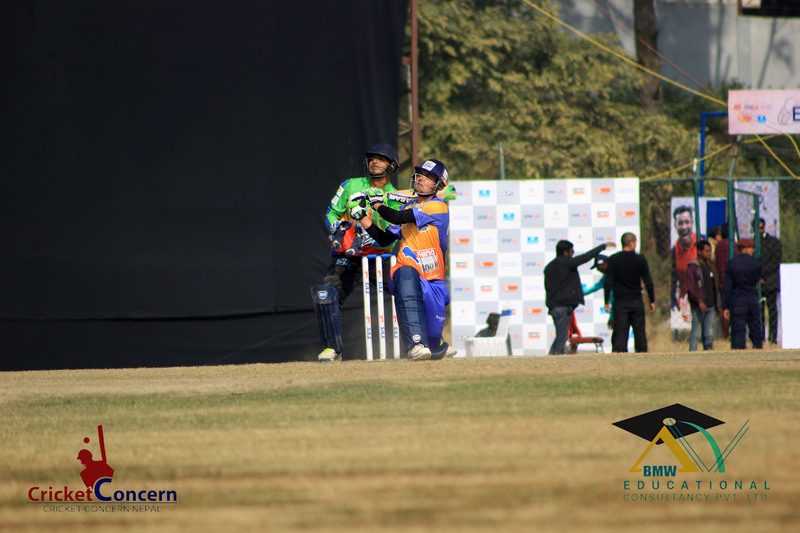 Bikram Sob,Taj Wali provided them a perfect start with a couple of wicket in first two over itself. Israrullah took 4 wickets where Taj Wali also grabbed 3 wickets to bundle-out the Tigers in the decent score of 113. For Chitwan Tigers, Dipendra Airee and Anil Mandal scored 42 and 32 runs respectively. In reply, there is nothing from Tigers bowlers as Rhinos chased down the target easily. Israrullah and Sunil Dhamala scored 61 and 46 runs respectively to sealed a victory for Rhinos. Israrullah hit 6 sixes and a four in his today’s inning. Sunil Dhamala also hit 2 sixes and 3 fours in his today’s inning. No any Tigers bowlers left any notch in today matches as every bowlers bowl at around 6 runs per over as Rhinos chase down the total in 17.4 over. Israrullah was declared as Man Of The Match for splendid performance with both bat and ball. Biratnagar Warriors will take on the challenge of Lalitpur Patriots in the second encounter of today double header.